Philippa of Hainault was born in Valenciennes, Hainaut, in the Low Countries, she was the daughter of William III, 'the Good' Count of Holland and Hainault, and Joan of Valois, the granddaughter of Philip III of France. Philippa spent her early years at the court of Hainault, renowned for its culture. She developed literary tastes and an interest in learning.
" The lady whom we saw has not uncomely hair, betwixt blue-black and brown. Her head is clean-shaped; her forehead high and broad, and standing somewhat forward. Her face narrows between the eyes, and the lower part of her face is still more narrow and slender than the forehead. Her eyes are blackish-brown and deep. Her nose is fairly smooth and even, save that it is somewhat broad at the tip and somewhat flattened, yet it is no snub-nose. Her nostrils are also broad, her mouth fairly wide. Her lips somewhat full, and especially the lower lip. Her teeth which are fallen and grown again are white enough, but the rest are not so white. The lower teeth project a little beyond the upper; yet this is but little seen. Her ears and chin are comely enough. Her neck, shoulders, and all her body and lower limbs are reasonably well shapen; all her limbs are well set and unmaimed; and nought is amiss so far as a man may see. Moreover, she is brown of skin all over, and much like her father; and in all things she is pleasant enough, as it seems to us. And the damsel will be of the age of nine years on St John's day next to come, as her mother saith. She is neither too tall nor too short for such an age; she is of fair carriage." The couple were betrothed four years later, when, in the summer of 1326, Queen Isabella, who was estranged from her husband, Edward II, visited the Hainault court, along with Prince Edward, to obtain aid from Count William to depose King Edward in return for the couple's betrothal. After a dispensation had been obtained for the marriage of the cousins (they were both great grandchildren of Philip III of France through their mothers), Philippa arrived in England in December 1327. She was escorted by her uncle, John of Hainaut, she was married to Edward III at York Minster, on 24 January 1328. Although Edward wore the crown, in the early years of their marriage, England was ruled by the Dowager Queen, his mother Isabella and her lover Roger Mortimer, Earl of March. In October 1330, King Edward took command of his kingdom, when he staged a coup and ordered the arrest of Isabella and Mortimer. Despite Isabella's pleas of "Fair son, have pity on gentle Mortimer!" he was tried for treason and beheaded at Tyburn. Isabella was treated more leniently by her son, she was initially transferred to Berkhamsted Castle and then held under house arrest at Windsor Castle until 1332, when she then moved back to her own property of Castle Rising in Norfolk. Edward and Phillipa's first child, Edward, later known as the Black Prince was born at Woodstock on 15th June, 1330 just nine days before Phillipa's sixteenth birthday. The dowager Queen, Isabella of France, is said to have doted on Edward III's eldest son. Phillipa's mother Joan of Valois, visited her in England in 1331. During a tournament to celebrate the visit, Phillipa famously interceded with the king on behalf of carpenters whose careless work on a platform resulted in an accident to herself and her ladies. Philippa reintroduced the bloodline of King Stephen into the English royal family. She was descended from Stephen's great-granddaughter Matilda of Brabant, the wife of Floris IV, Count of Holland. Their daughter Adelaide of Holland married John I of Avesnes, Count of Hainaut, Philippa's paternal great-grandfather. Philippa was also a descendant of another English monarch, the Saxon King Harold II, whose daughter Gytha of Wessex, married Vladimir II Monomakh of Kiev. From her maternal great-grandmother, Maria of Hungary, she descended from Elisabeth of Bosnia (born before 1241), a daughter of Kuthen, Khan of the Cumens and his Slavic wife, Galicie of Halicz, thus bringing Western Asian blood into the English royal line. Phillipa and Edward produced fourteen children in all and she was to outlive nine of them. Her second child, a daughter, was born at Woodstock on June 16, 1332 and named Isabella after her paternal grandmother. Isabella was her father's favourite daughter he was said to have doted on her. A second daughter, Joan, named after Phillipa's mother, was born in the Tower of London in late 1333 or early 1334. A son William was born at Hatfield on 16 February, 1337, but survived only a few months. In 1338, Philippa and Edward traveled to Euope to arrange alliances in support of Edward's claim to the French throne. Philippa stayed in Antwerp, where her son, Lionel, later Duke of Clarence, was born on November 29, 1338. He was to grow to be nearly seven feet tall. Philippa gave birth to another son John of Gaunt, later Duke of Lancaster, on March 6, 1340 at Ghent. A further son, Edmund, who would be created Duke of York, was born at Langley in June of 1341. In 1343, Phillipa gave birth to daughter, Blanche, who died soon after she was born. On October 10, 1344 she gave birth to a daughter named Mary, another daughter, Margaret, was born in 1346. Thomas and William were born at Windsor in 1347 and 1348 respectively. Three of her children, her daughter Joan and young sons, Thomas and William, who had been born in 1347 and 1348, were to die during the outbreak of bubonic plague known as the Black Death in 1348. Joan was betrothed to Peter of Castile, son of Alfonso XI of Castile in 1345, and left England to journey to Castille in the summer of 1348. She stayed at the city of Bordeaux, in southern France, en-route, where there was a severe outbreak of the plague. Members of her entourage began to fall sick and die and Joan was moved, probably to the small village of Loremo, where she succumbed to the Black Death, suffering a violent attack she died on September 2, 1348. Phillipa's last child, Thomas was born at Woodstock in 1355. Before 1335 Philippa had established a small colony of Flemish weavers at Norwich, and she displayed an active interest in the weaving trade by repeated visits to the town. She also encouraged coal-mining on her estates in Tynedale. Phillipa was kind and inclined to be generous and exercised a steadying influence on her husband. Phillipa of Hainault was a popular Queen Consort, who was widely loved and respected, and theirs was a very close marriage, despite Edward's frequent infidelities. She frequently acted as Regent in England during Edward's absences in France. A generally accepted story, based on the chronicles of Froissart, is that Phillipa summoned the English forces to meet the Scottish invasion of 1346, and addressed the troops before the Battle of Neville's Cross. Froissart describes her as being "tall and upright, wise, gay, humble, pious, liberal and courteous." Philippa accompanied her husband on his expeditions to Scotland, and France during the Hundred Years War, where she was to win acclaim for her gentle and compassionate nature. In 1347, she persuaded her husband to spare the lives of the burghers of Calais, whom he had planned to execute after the Siege of Calais. "We have, my husband, enjoyed our long union in peace and happiness, but before we are forever parted in this world, I entreat you will grant me three requests." "Lady, name them," answered Edward, "they shall be granted." "My lord," she whispered, "I beg you will pay all the merchants I have engaged for their wares; I beseech you to fulfill any gifts or legacies I have made to churches and my servants; and when it shall please God to call you hence, that you will lie by my side in the cloisters of Westminster Abbey." As she passed, the king was in tears. "Lady," he said, "all this shall be done." Jean Froissart, of whom she was patron, wrote a lament on the queen's death. She was buried at Westminster Abbey. 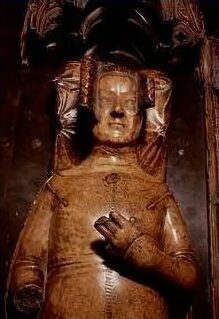 Her tomb is on the south side of the Chapel of Edward the Confessor and displays her alabaster effigy which was executed by sculptor Jean de Liège. 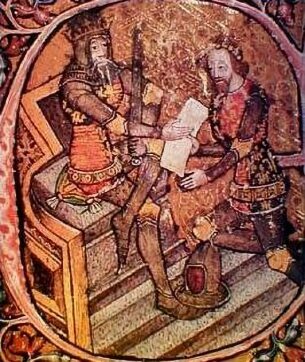 (1) Edward of Woodstock, Prince of Wales, The Black Prince, (1330-76) m. Joan Plantagenet, Countess of Kent. (2) Isabella (1332- 1382) m. Enguerrand de Coucy, Seigneur de Coucy, Earl of Bedford. (ii) Phillipa de Coucy (d.1411) m. Robert de Vere, Earl of Oxford. (5) Lionel of Antwerp, Duke of Clarence (1338-1368) m. (1) Elizabeth de Burgh, Countess of Ulster. (2) Violante Visconti. (i) Phillipa Plantagenet, Countess of Ulster (1355-78) m. Edmund Mortimer, Earl of March. From this marriage descended the House of York. (6) John of Gaunt, Duke of Lancaster and Aquitaine, Earl of Richmond. (1340-99) m. (1) Blanche Plantagenet (2) Constance of Castille (3) Katherine Swynford. (iv) HENRY IV (1367-1413) m. (1) Mary de Bohun, Countess of Hereford. (2) Joan of Navarre from the first marriage descended the House of Lancaster. (vi) Elizabeth of Lancaster (1365-1425) m. (1) John Hastings, Earl of Pembroke (2) John Holland, Duke of Exeter (3) Sir John Cornwall. 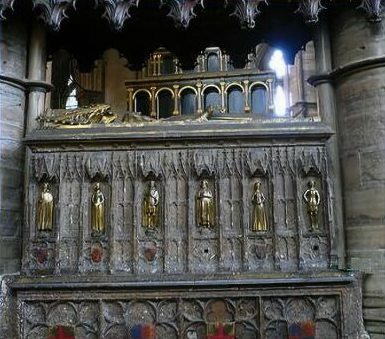 (11) Thomas of Woodstock, Earl of Buckingham, Duke of Gloucester (1335-97) m. Eleanor de Bohun.